Earlier this year, I reviewed Guilty Guitars’ remix album RMXD which the Hamburg based three-piece offered as a free download on their homepage. This web release was preceded six months earlier by their second longplayer In Need Of Now which shows the band from their purer indie guitar rock side. 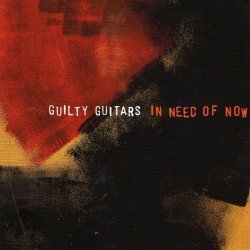 Guilty Guitars have a very straightforward approach when it comes to instrumentation. Jan Basters is in charge of vocals and guitars, while his brother Stephan lay down the bass lines to which Jörn Bruckner delivers the drums. Don’t expect these guys to experiment around as they did on their following release. Yet this hardly translates to the music. The songwriting is anything but trite, and the album takes a couple of spins before the melodies finally hook themselves in your memory. But don’t we prefer this to more accessible fast-food fare which loses its interest after no time at all? The twelve tracks on In Need Of Now nearly take up an entire hour, with half of the material running longer than five minutes. It’s especially here where one would wish the band to act at times more concisely. Some of the longer pieces work just fine, like Recall, but otherwise you can’t deny that their more compact songs have a more immediate charm, as can be witnessed on the not even three minute long upbeat Any Other Day with its magnificent vocal harmonies. Guilty Guitars don’t hide their roots in German indie rock from the Nineties. Back then, bands like Sharon Stoned, Blackmail and Sans Secours (ok, they were Austrians) crafted a whole new sound for indie fans from Germany and neighbouring countries. As great as that movement was, I welcomed Guilty Guitars’ excursion into more electronic territories, and hope that in the future they will be able to combine the best of both worlds.